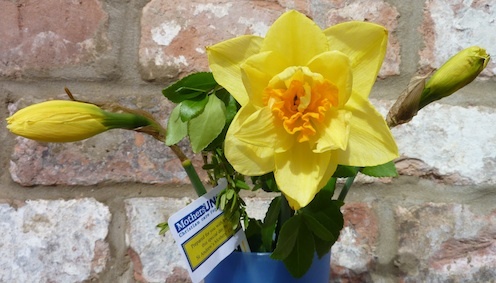 On Mother’s Day daffodils are often given to children to give to mums. Today our little friends Daniel and Nathan, daffodils in hand, knocked at our door. ‘Quite fine thanks‘ said nearly 4 year old Daniel before sticking out his foot for us to admire his Stompasaurus shoes. ‘Look at my new Star Wars lego t-shirt’ beamed 6 year old Nathan. ‘You can touch it, it’s bumpy. Oh, these are for you’. Mission accomplished Nathan and Daniel turned to more serious matters of shoe comparisons and R2D2 role playing while we spoke with their dad. The sentiment of what they’d actually done was very sweetly lost on them but the thoughtfulness of their parents will remain with me always (we miscarried our first baby last month after over a decade of trying to become pregnant). Special thoughts today for mothers without children and children without mums. We included all the women who are trying to be mums and struggling in this area in the mum’s prayer today. They got flowers too along with all the other mums and were included in everything as we are beleiving with them in faith on this special day. Happy Mother’s day for all mum’s and mum’s waiting to be mums. Lovely – and thanks too to Angela. It’s a kind of strange day when you’d love to be on the receiving end of it all, but aren’t/can’t be. I am without a Mum and not a mum so thank you from me too! It becomes a day of Remembrance in my home, so I put flowers out on the table for my Mother and spend it quietly. How lovely to have children come to the door with flowers, a friend brought me some tulips on Saturday, all bright and chirpy. That’s a lovely story, Nic. My partner lost his Mum also last year so this was our first year with both Mums gone, and we decided that we could still have Mother’s Day, even tho we celebrated it by ringing up both our Dads (still alive) and inviting my Dad round for tea. Angela – thanks for sharing your thoughtful comments and links. What a joyous sound the choir create. Music is definitely soothing to the soul! A lovely piece Nic. I have a mother, but I am sadly not one, so it’s nice to think someone is thinking of us.